All metals deform (stretch or compress) when they are stressed, to a greater or lesser degree. This deformation is a visible sign of metal strain. In metallurgy, strain can be defined as the deformation of a metal due to stress. In other words, it's a measure of how much a metal has been stretched or compressed when compared to its original length. If there is an increase in the length of a piece of metal due to stress, this is referred to as tensile strain. But if there's a reduction in length, this is compressive strain. Some metals (such as stainless steel and many other alloys) yield under stress. It allows them to bend, or deform, without breaking. Other metals, such as cast iron, fracture and break quickly under stress. Even stainless steel, however, finally weakens and breaks under enough stress. Metals such as low carbon steel bend rather than breaking under stress. At a certain level of stress, however, they reach a well-understood "yield point." Once they reach the yield point, the metal becomes "strain hardened." It means that more stress is required to deform the metal any further. The metal becomes less ductile, or bendable. In one sense, this makes the metal harder. But while strain hardening makes it harder for the metal to deform, it also makes the metal more brittle. Brittle metal can break, or fail, quite easily. Some metals are intrinsically brittle, which means they are particularly liable to fracture. Brittle metals include medium and high carbon steels. Unlike ductile materials, these metals do not have a well-defined yield point. Instead, when they reach a certain stress level, they break. Brittle metals behave very much like other brittle materials such as glass, stone, and concrete. Like these materials, they are strong in certain ways -- but because they cannot bend or stretch, they are not appropriate for certain uses. The most common measure of strain in metals is called engineering strain. Engineering strain can be calculated as the change in length divided by the original length. 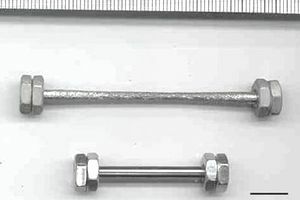 For example, a 2.0" titanium bar that has been stretched to 2.2" is said to have experienced a tensile strain of 0.1, or 10 percent. When ductile metals are stressed, they deform. If the stress is removed before the metal reaches its yield point, the metal returns to its former shape. While the metal appears to have returned to its original state, however, tiny faults have appeared at the molecular level. Each time the metal deforms and then returns to its original shape, more molecular faults occur. After many deformations, there are so many molecular faults that the metal cracks. When this occurs, it is described as "metal fatigue." Metal fatigue is irreversible. Metal fatigue is particularly problematic in situations where metal is stressed over and over again. For example, it was a major cause of aircraft failure before it was fully understood. To avoid metal fatigue, it is important to examine samples of metal under stress using a microscope regularly. Which Metals Oxidize and Corrode?